December 19, 1871 – The Chicago Tribune prints a letter from an “Old Citizen” [Chicago Tribune, December 19, 1871] who relates in detail, right down to the names on storefronts and households, what the city looked like in 1846. The writer arrived in September,1846, having “decided to take my chances for life and fortune here.” South of Fort Dearborn, located at the river and what is today Michigan Avenue, everything was “an everlasting stretch of prairie and little sand-hills along the lake-shore. At the corner of Clark and Washington Streets stood the Methodist and Second Presbyterian Churches. Everything east of Clark Street and south of Madison Street was “open prairie [and] … large numbers of family cows.” A “country tavern,” the Southern Hotel, stood at the corner of State Street and Twelfth Street, near “Widow Clark’s fine residence … near Eighteenth street, near Michigan avenue.” Five bucks a week was the rate for “good board, furnished room, fuel, and lights, for gentleman and wife.” The monthly rent for a “good office” was four dollars. The rent of a “nice house, modern appointments” was $125.00 to $175.00 a year, paid in quarterly installments. The image above shows the city as it may have looked in the mid-1840's. December 19, 1948 – Chauncey McCormick, the executor of the estate of Kate Sturges Buckingham, announces that with the war won and materials once again available, movement is being made on following Buckingham’s wish to construct a great memorial to Alexander Hamilton. McCormick says that about 20 possible locations for the memorial were surveyed in 1947, and the number of sites has since been narrowed down to about seven. Trustees of the memorial fund are especially interested in the site of the United States Courthouse in the block bounded by Adams and Jackson on the north and south and Dearborn and Clark on the east and west. (Imagine a nine-foot statue of the founding father fighting for attention with Alexander Calder’s “Flamingo”!) Buckingham established the memorial fund for the tribute to Hamilton in 1928, and when she died in 1937 her will specified that if the memorial had not been started by December 14, 1947 the million dollars set aside for it would go to the Art Institute to use as it wished; in 1947, therefore, the memorial trustees went to court and obtained an order delaying the date for completion to January 1, 1953. The story of Buckingham’s desire for the memorial to Hamilton is a long one and, to some, a tale with a less than a satisfactory ending. You can read more about it here. 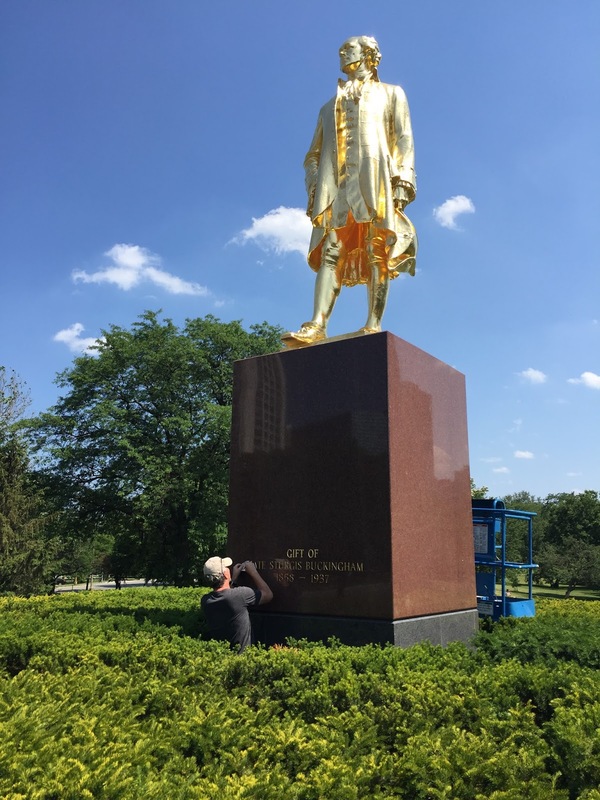 The photo above shows the state of the memorial today after a re-gilding effort in 2016 and 2017.